If I were ever to find myself in the position of having tremendous wealth (keep working, hubby), I think I would decorate one of my numerous homes (probably the one in Paris) entirely in chinoiserie. Chinoiserie is the Asian-influenced style that became popular in European decoration and design during the 17th and 18th centuries (as trade increased). 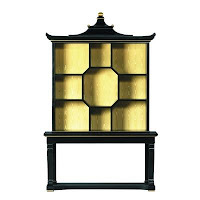 The term Chinoiserie refers to the European-made imitations of Asian design, not to things actually made in Asia (and incorporates Japan and other Asian influences, not just China). While I admire Asian design, I happen to prefer the imitations, which have an English-ness or French-ness they can't seem to shake, no matter how much they try. 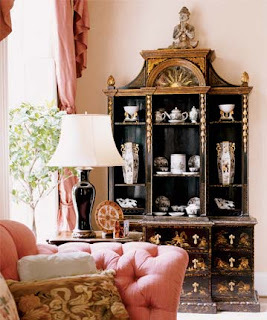 The beautiful pink room above was featured in Southern Accents magazine. The piece in this room is obviously an antique, but this reproduction bookcase from Dorothy Draper would fill in nicely, and has a very pretty, modern quality. 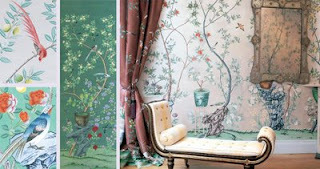 There are few things in this world that would drive me to steal, but if it were possible, I would peel this De Gournay wallpaper off the wall with my fingernails in order to have it in my home. It is all hand-painted (and thus, quite expensive) and so super-dreamy, I can't stand it. It's possible to incorporate chinoiserie in more subtle (and less costly) ways- this Chippendale-style Macau chair from Ballard Design is $279, and this pretty Ginger Jar Lamp from ShopTableLamps.com is just $150. I'm also crazy about these lovely linens from Leontine Linens. They have several Asian-inspired styles, and this bamboo-looking monogram just does it for me. 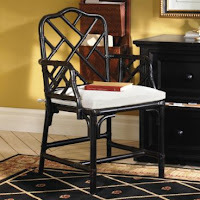 Lastly, what would a decorating post be without hearing from our friends at Domino? 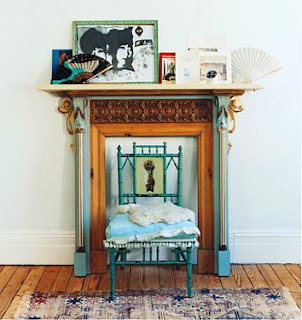 This turquoise chair/ fireplace combo feels like it stepped out of a dream. I love how their ornateness contrasts with the simple sanded wood floors and the worn rug. How do you say "gorgeous" in Chinese? i don't know, but in Korean it would be "yeh-pu-dah" : ) great post, such great stuff!